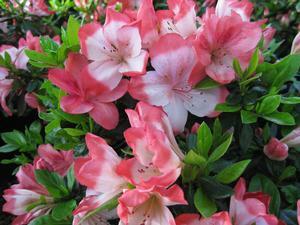 Betty began our business in 1962 by propogating and growing azaleas. We honor our history through our name and by continuing to offer the largest selection of azaleas in any garden center in America. We feature Kurume, Glenn Dale, Gable, Robin Hill, and Satsuki varieties, among others. New to azaleas are the everblooming varieties: Encores, Bloomathons, and the newest, Garden Debut. Our azalea fields explode with color during the spring. Come for a leisurely stroll. Bring the kids and your camera for a great photo op!